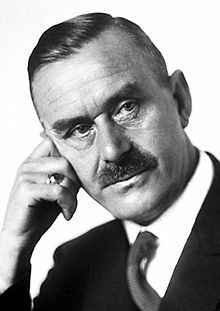 Ba scríbhneoir clúiteach Gearmánach é Paul Thomas Mann (rugadh ar an 6 Meitheamh 1875 i Lübeck é; d'éag sé ar an 12 Lúnasa 1955 i gKilchberg i gcóngar do Zürich). Ina chuid úrscéalta agus gearrscéalta íorónta thug sé cur síos dúisitheach ar dheireadh na tréimhse buirgéisí i stair chultúrtha na Gearmáine. I dtraidisiún liteartha na Gearmáinise, is buirgéiseach léannta é féin, agus é faoi thionchar filí cosúil le Johann Wolfgang von Goethe agus Theodor Fontane. B'í a stíl shainiúil a thabhaigh gnaoi na léitheoirí dó, agus ba luath ina shaol a d'aibigh sé mar scríbhneoir. Ní raibh sé ach dhá bhliain fichead d'aois, nuair a d'fhoilsigh sé an t-úrscéal mór úd Buddenbrooks ("Muintir Buddenbrook"), arb é scéal an teaghlaigh bhuirgéisigh úd Buddenbrook i Lübeck é. B'é an t-úrscéal seo a thuill Duais Nobel na Litríochta dó sa bhliain 1929. I mblianta an Chéad Chogadh Domhanda, bhreac sé síos Betrachtungen eines Unpolitischen ("Nótaí ó fhear neamhpholaitiúil"), inar chosain sé impireacht na Gearmáine, go gairid sular imigh an impireacht úd de dhroim an tsaoil. Ní ba deireanaí ina shaol, d'athraigh sé aigne i leith na himpireachta. Ina chuid aistí polaitiúla, chuir sé in iúl go raibh sé ag tacú le Poblacht Weimar mar dhuine den tseanaicme bhuirgéiseach. Nuair a tháinig Adolf Hitler i gcumhacht, chuaigh sé ar imirce. I Meiriceá, bhí sé ina chraoltóir bolscaireachta, agus é ag gríosú na nGearmánach in aghaidh an Naitsíochais. Cuid den oidhreacht liteartha a d'fhág sé ina dhiaidh is ea a chuid dialann, ina dtráchtadh sé ar chúrsaí na polaitíochta domhanda chomh maith lena shaol príobháideach féin. Scríbhneoirí tábhachtacha ab ea a dheartháir Heinrich Mann agus triúr dá sheisear clainne: Erika, Golo agus Klaus Mann. 2.4.1 "An Sliabh faoi Dhraíocht"
Trádálaí agus seanadóir (is é sin, ball de rialtas áitiúil na cathrach) ab ea athair an scríbhneora, Thomas Johann Heinrich Mann. Maidir leis an máthair, Julia da Silva Bruhns, ba de phór na Brasaíle í ó thaobh a máthara féin de. Bhí deartháir amháin ag an scríbhneoir ba sine ná eisean, mar atá, Heinrich Mann, a chuaigh i mbun pinn chomh maith, agus deartháir b'óige ná an bheirt acu, mar atá, Viktor. Saolaíodh beirt dhéirféaracha dóibh fosta, mar atá, Julia Óg agus Carla, ach má saolaíodh féin, chuir Julia óg lámh ina bás féin nuair a bhí sí 50 bliain d'aois, rud a bhí déanta cheana féin ag Carla, agus í féin 30 bliain d'aois. Agus an méid sin ráite, ní mór cuimhne a choinneáil air gur teaghlach tábhachtach measúil ab ea muintir Mann, agus bhain Thomas óg sult as a shaol nuair a bhí sé ina bhuachaill beag. Sa bhliain 1891, fuair athair an scríbhneora bás le hailse an fhualáin. De réir mar a bhí ordaithe aige ina uacht, díoladh teach an teaghlaigh i Lübeck agus gnó an athar, agus cuireadh an t-airgead in infheistíochtaí le hús a thabhairt. Ar an ús sin a bhí an teaghlach ag teacht i dtír i ndiaidh bhás shean-Tomáis. Bhí Thomas Mann an-seanchríonna mar pháiste, agus ba léir dó ó thús go mbeadh sé ina scríbhneoir an lá ab fhaide anonn. Nuair a bhí sé ocht mbliana déag d'aois, bhí seisean agus roinnt comhscoláirí leis ag foilsiú iris dá gcuid féin, ar ar thug siad Der Frühlingssturm, nó "Stoirm an Earraigh". Sa bhliain 1894, d'fhág sé a scoil i Lübeck agus thug sé aghaidh ar München, áit a raibh cónaí ar a mháthair agus ar a chuid deirfiúracha agus deartháireacha cheana féin. An fear a bhí curtha ag tabhairt aire do chlann shean-Tomáis, bhí sé den tuairim gur chóir do Thomás óg ceird éigin a fhoghlaim nuair a bheadh an scoil críochnaithe aige. Chaith Thomas Mann tamall ina chúntóir i gcomhlacht árachais, ach níor thaitin an obair leis. D'éirigh leis, áfach, cúpla scéal a fhoilsiú in irisí aithnidiúla, agus mar sin, bhí an oiread muiníne aige as féin is gur thréig sé na cúrsaí árachais sa bhliain 1895. Thosaigh sé ag déanamh staidéir in Ardscoil Teicneolaíochta München le go mbeadh eolas aige a chuideodh leis nuair a rachadh sé le hiriseoireacht mar shlí beatha. Sa bhliain 1896, tháinig sé i mbun a mhéide go hoifigiúil, nuair a shlánaigh sé bliain is fiche d'aois. Ansin, thosaigh sé ag fáil a chuid féin d'ús a oidhreachta, agus ar an síntiús míosúil a bhí ag teacht dó, bhí sé ábalta a shaol a mhaoiniú mar shaorscríbhneoir. 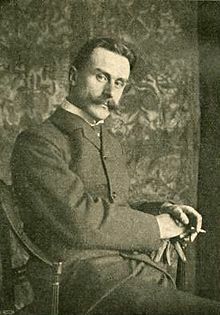 Sna blianta 1895-1896, bhí Thomas Mann ag scríobh don mhíosachán choimeádach úd Das Zwanzigste Jahrhundert ("An Fichiú hAois"). Sa bhliain 1897, chuaigh Thomas Mann agus a dheartháir Heinrich go dtí an Iodáil, áit a bhfuair siad teach ar cíos i bPalestrina in aice leis an Róimh. Ansin, scríobh siad Bilderbuch für artige Kinder, cineál scigaithrise ar leabhar faoi stair na n-ealaíon. Bhronn siad an leabhar - ní raibh ach aon chóip amháin ann - ar a ndeirfiúir Carla. I ndiaidh fhéinmharú Charla, shealbhaigh Viktor Mann í, agus sa deireadh, d'fhág sé an leabhar ag clann Thomas Mann. Nuair a chuaigh an teaghlach ar deoraíocht, áfach, cailleadh an leabhar. Níl ach iarsmaí - cóipeanna de chúpla pictiúr sa leabhar chomh maith le cuid de na dánta mar ba chuimhin le Viktor iad - fágtha den aon saothar amháin a rinne an bheirt deartháracha in éineacht. I bPalestrina dó, scríobh Thomas Mann cúpla gearrscéal, ina measc Der kleine Herr Friedemann ("An fear uasal beag Friedemann"), agus chuir sé tús le Buddenbrooks. Nuair a tháinig sé ar ais go dtí an Ghearmáin, ní raibh sé sásta scríobh do Das Zwanzigste Jahrhundert a thuilleadh, ós rud é gur thosaigh frith-Ghiúdachas na hirise ag cur isteach air. Ina áit sin, chuaigh sé ag obair don iris aorach úd Simplicissimus. Sa bhliain 1900, chuaigh sé sna saighdiúirí i München. Bhí sé le hóglachas aon bhliana a dhéanamh ansin, ach nuair a tháinig an crú ar an tairne, ní raibh mórán maithe ann mar shaighdiúir, agus caitheadh amach arís é i ndiaidh trí mí. Thosaigh Mann ag scríobh Buddenbrooks i 1897, an chéad úrscéal leis. Tháinig Buddenbrooks i gcló i mí Dheireadh Fómhair 1901. Foilsíodh an chéad eagrán ina dhá imleabhar, agus ní bhfuair sé mórán fáilte ó na léirmheastóirí. Níor thosaigh siad ag tuiscint fhiúntas an leabhair sular tháinig an dara heagrán amach in aon imleabhar amháin, sa bhliain 1903. Thabhaigh an t-úrscéal an-cháil do Mann, agus bhí muintir Lübeck ag ráflaíocht eatarthu faoi na bunchuspaí a bhí ag pearsana an úrscéil, mar a chonacthas dóibhsean. B'é an t-úrscéal seo, go bunúsach, ba chúis leis go bhfuair an scríbhneoir Duais Nobel na Litríochta sa bhliain 1929. Sa bhliain 1903, thosaigh an caidreamh idir Thomas Mann agus a dheartháir Heinrich ag dul ó mhaith. Bhí Thomas míshásta le chomh "mínáireach" agus a bhí saothar a dhearthára mar scríbhneoir. B'é an t-úrscéal Die Jagd nach Liebe ("An Tóir ar an nGrá") a d'fhoilsigh Heinrich san am sin ba mhó a chuir isteach ar Thomas. Ní féidir a rá go mbeadh scoilt iomlán tagtha idir an bheirt acu riamh, agus uaireanta, d'fheabhsódh na cúrsaí arís, ach bhí siad scoite scartha mar scríbhneoirí agus mar ealaíontóirí anois, agus ní rithfeadh leo a dhath a scríobh in éineacht a thuilleadh. Sa bhliain 1904, fuair Thomas Mann aithne ar Katia Pringsheim, gariníon don tsufraigéid Hedwig Dohm, agus chuir sé ceiliúr pósta uirthi. Go dtí sin, níor thrácht sé ina chuid nótaí pearsanta ach ar an taitneamh a thugadh sé d'fhir óga eile, cosúil le Paul Ehrenberg, péinteálaí agus ceoltóir, a bhí ina chara maith aige sna blianta 1899-1904. Cé go raibh blas na homaighnéasachta ar an gcairdeas seo, dealraíonn sé nach ndeachaigh Mann riamh a fhad le gníomhartha gnéasacha leis, ná le haon chairdeas eile den chineál seo. Bhí an homaighnéasacht ina téama tábhachtach i gcuid dá shaothar, go háirithe sa ghearrscéal fada Der Tod in Venedig. Bhí Katia cineál idir eatarthu ar dtús, ach sa deireadh, ghlac sí leis an gceiliúr pósta, agus phós siad ar an 11 Feabhra 1905. Rugadh seisear clainne dóibh, mar atá, Erika (1905-1969), Klaus (1906-1949, féinmharú), Golo (1909-1994), Monika (1910-1992), Elisabeth (1918-2002) agus Michael (1919-1977). An clann, 1919: Monika, Golo, Michael, Katia (bean), Klaus, Elisabeth, Erika. Sa bhliain 1912, cuireadh Katia ag fáil leighis i Davos san Eilvéis, ó shíl a dochtúir go raibh eitinn uirthi. Nuair a tháinig an scríbhneoir ar cuairt chuici ansin, chuaigh atmaisféar na háite go domhain i gcion air, agus chuir sé tús leis an mórúrscéal úd Der Zauberberg. Bhreac sé síos an chéad chúpla líne sa bhliain 1913, ach níor chríochnaigh sé an t-úrscéal seo roimh an mbliain 1924. Sa bhliain 1915, chuir sé an obair seo i leataobh ar feadh tamaill. Nuair a thosaigh an Chéad Chogadh Domhanda sa bhliain 1914, bhí scríbhneoirí ann a d'fháiltigh é, cosúil le cuid mhór de mhuintir na Gearmáine. Bhí Alfred Kerr, Robert Musil, Richard Dehmel, agus Gerhart Hauptmann suite siúráilte go raibh gá agus tábhacht leis an gcogadh. Bhí Mann ina thírghráthóir freisin, ach mar sin féin, bhí sé cineál idir eatarthu. Ón taobh eile de, bhí fuath aige ar an Rúis Impiriúil mar stát tíoránta dianphoilíneachta, agus é barúlach gur chóir cogadh a chur ar a leithéid de thír. Sa téacs Gedanken im Kriege ("Smaointí le linn an Chogaidh"), chosain sé na scríbhneoirí a bhí ag fáiltiú an chogaidh, ach faoin am sin, ní raibh caidreamh ar bith a thuilleadh aige leo siúd a cháin é, cosúil le Hermann Hesse, Stefan Zweig, agus Arthur Schnitzler. Nuair a tháinig Poblacht Weimar ar an bhfód i ndiaidh an Chéad Chogadh Domhanda, ní raibh Mann cinnte ar dtús, cén dearcadh ba chóir a bheith aige ina leith. Ar an 24ú lá de Mheitheamh 1922, dúnmharaíodh Aire Gnóthaí Eachtracha na Poblachta Walter Rathenau, rud a chuaigh go mór i gcion ar Mhann, ionas gur thosaigh sé ag cosaint na Poblachta go poiblí. Thug sé óráid cháiliúil faoin teideal Von deutscher Republik ("Ag Trácht ar Phoblacht na Gearmáine"), agus é ag cur an daonlathais chun cinn mar rialtas daonnachtúil. Thairis sin, chuaigh sé mar bhall le Páirtí Daonlathach na Gearmáine (Deutsche Demokratische Partei), an páirtí liobrálach. Sa bhliain 1924, d'fhoilsigh sé a úrscéal Der Zauberberg ("An Sliabh faoi Dhraíocht"), leabhar a raibh mór-rath uirthi ón tús. Ina dhiaidh, tháinig Unordnung und frühes Leid agus Über die Ehe. Sa bhliain 1925, chrom sé ar an tsraith cheithre úrscéal úd Joseph und seine Brüder ("Seosamh agus a dheartháracha"). Tháinig an scéal as an Sean-Tiomna, ach bhí pearsa Sheosaimh bunaithe ar na fir óga a chuir draíocht ar mo dhuine i rith na mblianta, ina measc Klaus Heuser, ógánach seacht mbliana déag d'aois, a bhfuair Mann aithne air sa bhliain 1927 - cara de chuid a chlainne a bhí ann. Bhí Mann ar duine acu siúd a bhunaigh Roinn na Filíochta d'Acadamh Prúiseach na nEalaíon, agus é ag cur catha ar an Schmutz- und Schundgesetz, is é sin, an dlí a chuir cosc ar "thruflais liteartha" a "dhéanfadh damáiste don aos óg". Bhí Mann den tuairim gur dlí a bhí ann a chuir srianta le cruthaitheacht na scríbhneoirí agus a rabhthas ag baint úsáide as mar dhlí cinsireachta. Sa bhliain 1929, bronnadh Duais Nobel na Litríochta ar Thomas Mann, agus le fírinne, bhí súil aige léi cheana, le dhá bhliain anuas. Tráthnóna ar an 12 Samhain 1929, tháinig an scéala ó Stócólm. Bhain sé mealladh as Mann nár luadh ach an chéad mhórúrscéal leis, Buddenbrooks, mar chúis leis an duais. B'é an míniú ná go raibh coiste na duaise faoi thionchar an léirmheastóra Fredrik Böök, a bhí an-mhíshásta le Der Zauberberg. Cibé scéal é, slám maith airgid a bhí ann nuair a fuair sé an duais, agus bhí sé ábalta fiacha an teaghlaigh a ghlanadh. Mar sin féin, ní raibh de mheabhraíocht aige an t-airgead a infheistiú taobh amuigh den Ghearmáin, mar a moladh dó, agus nuair a chuaigh sé agus a mhuintir ar imirce i ndiaidh do na Naitsithe an chumhacht a shealbhú sa tír, chaill siad cuid mhór dá maoin shaolta. Sa bhliain 1930, d'éirigh na toghcháin go maith leis na Naitsithe, ach níor tháinig siad chun cumhachta go fóill. Bhí Mann drochamhrasach i leith an Naitsíochais, agus ar an 17 Deireadh Fómhair, thug sé óráid thábhachtach sa Bheethovensaal i mBeirlín, Die Deutsche Ansprache nó an Óráid Ghearmánach, mar a thug sé ar an óráid. Bhí cúpla Naitsí istigh agus iad ag iarraidh cur isteach ar an óráid, ach níor éirigh leo. Cháin Mann "brúidiúlacht mhargaidh" na Naitsithe agus a gcuid sluaghairmeanna liosta nach raibh, dar leis, ag teacht le híomhá na nGearmánach mar "náisiún cultúrtha". Fuair sé an-bhualadh bos, ach níor chualathas taobh amuigh den Bheethovensaal é. Is é sin, níor chualathas sa Ghearmáin féin é. Ach is léir gur tugadh an-aird ar a chuid focal i dtíortha eile, agus an saol mór ag éirí buartha faoin gcuma a bhí ag teacht ar chúrsaí na Gearmáine. 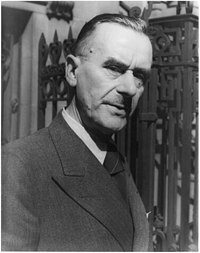 Sa bhliain 1933, chuaigh Thomas Mann agus a mhuintir ar imirce le teacht slán ó na Naitsithe. Ar dtús, chuir siad fúthu i Sanary-sur-Mer i ndeisceart na Fraince, ach ansin, roghnaigh siad an Eilvéis, agus ansin dóibh, chónaigh siad i gKüsnacht in aice le Zürich. Ní raibh sé sábháilte ansin, áfach, nó ní raibh de dhoiciméad pearsanta aige ach a phas, agus é ag dul as feidhm. Dá rachadh sé go dtí an Ghearmáin le pas nua a fháil, d'imtheorannófaí é. Ar ámharaí an tsaoil, bhronn an tSeicshlóvaic saoránacht air, rud a bhí ina ábhar iontais aige féin. Mar dhíoltas, bhain na Naitsithe a shaoránacht Ghearmánach agus a dhochtúireacht oinigh in Ollscoil Bonn de. Cé go raibh Mann ar deoraíocht, bhí sé ábalta cuid mhaith taistil a dhéanamh sna tríochaidí. Chuaigh sé ar cuairt go dtí na Stáit Aontaithe sna bhlianta 1934 agus 1935, agus bhí an oiread ardmheasa ag na Meiriceánaigh air is gur thug siad cead isteach dó fiú gan phas ceart. Théadh sé go dtí an Ungáir freisin, áit a bhfáiltíodh a chara Lajos Hatvany isteach chuige é. D'fhoilsíodh sé altanna ar an bPester Lloyd, páipéar Gearmáinise a bhí á foilsiú san Ungáir. Sa bhliain 1938, thréig Mann agus a theaghlach an Eoraip. Bhí Hitler tar éis an Ostair a shealbhú agus a nascghabháil, agus an chosúlacht ag teacht ar an scéal nach mbeadh Mann sábháilte san Eilvéis féin a thuilleadh. Tá sé ag luí go trom orm, ceart go leor. Ach, le taobhshúil ar an atmaisféar nimhithe thiar sa Ghearmáin, is fusa cur suas leis an deoraíocht, nó is léir nach bhfuil aon rud fiúntach fágtha i mo dhiaidh agam. Tiocfaidh an Ghearmáin liom áit ar bith a rachaidh mé. Tá mé ag iompar mo chultúir Ghearmánaigh taobh istigh díom. Tá mé i dteagmháil leis an saol mór, agus ní dóigh liom gur duine caillte mé. B'í Ollscoile Princeton an chéad stáisiún ar bhealach a dheoraíochta. Fuair sé ollúntacht ansin, agus cead aige obair ar an úrscéal stairiúil a bhí sé a scríobh faoi Goethe - Lotte in Weimar, a tháinig i gcló sa bhliain 1939. Nuair a phléasc an Dara Cogadh Domhanda amach, ba spreagadh é do Mann chun páirt a ghlacadh i ngníomhaíochtaí éagsúla. Bhí sé ina bhall ina lán coistí agus eagraíochtaí a bhí ag cuidiú le lucht iarrtha dídine ón Eoraip, cosúil leis an Unitarian Service Committee agus Committee for Jewish and Christian Refugees. Sa bhliain 1940, thug sé an chéad óráid raidió uaidh faoin teideal Deutsche Hörer! ("A Lucht Éisteachta sa Ghearmáin!"). Thaifeadtaí a chuid óráidí míosúla i gCalifornia, agus chuirtí an ceirnín san aerphost go Nua-Eabhrac. Ansin, théadh an óráid go dtí BBC le haghaidh craolacháin, ionas go raibh sé le cloisteáil sa Ghearmáin féin. Cé go raibh sé thar a bheith dainséarach cluais a thabhairt do na craolacháin seo i dtír na Naitsithe, bhí lucht áirithe éisteachta acu ansin. Cháin Mann an deachtóireacht go fíochmhar ina chuid craolachán, ach mar sin féin, bhí greann áirithe ag baint leo chomh maith. Mar shampla, dúirt sé, uair amháin: Ó bhuel, is uafásach an rud é an cogadh, ach ní mór an taobh maith a aithint air chomh maith. Ar a laghad, ní bhíonn Hitler ag óráidíocht faoi chúrsaí an chultúir anois. Bhí Mann ar an mbeagán deoraithe polaitiúla Gearmánacha ar thug Hitler freagra dóibh go pearsanta ina chuid óráidí féin, agus ar ndóigh, ní raibh Mann mall ag déanamh a thráchta féin ar thuairimí an deachtóra. Bhain Mann an-sult as laigí Hitler mar óráidí, agus é ag cur béime ar a chuid tairngreachtaí féin ón am roimh an gcogadh agus ar an dóigh ar tháinig siad isteach fíor. Sa bhliain 1941, chuir muintir Mann fúthu i bPacific Palisades idir Santa Monica agus Malibu. B'ansin a chrom an scríbhneoir ar an úrscéal mór Doktor Faustus a scríobh. Cineál faoistin a bhí ann, agus é ag tabhairt cur síos siombaileach ar imeachtaí agus ar fhórsaí a shaoil féin. Go bunúsach, athinsint ar mhiotas Gearmánach an dochtúra Faust atá ann - fear a dhíol a anam leis an diabhal le léargas a fháil ar rúin na cruinne. San úrscéal, is ceolchumadóir é Faust - ceolchumadóir darb ainm Adrian Leverkühn. Chuir galar tromchúiseach - ailse na scamhóg - isteach ar Mann san obair seo, ach sa deireadh, d'éirigh leis an leabhar a chríochnú, agus tháinig sí i gcló sa bhliain 1947. I ndiaidh an chogaidh, bhí an-diospóireacht sa Ghearmáin féin faoi óráidí Mann. Bhí cuid de na héisteoirí den tuairim go raibh Mann ag milleánú mhuintir na Gearmáine go léir faoi dheachtóireacht Hitler, ach ón taobh eile de, bhí an dream ann freisin a chreid nach raibh Mann ach ag fáil loicht ar atmaisféar Phoblacht Weimar agus ar chomh fabhrach a bhí sé do ghrúpaí antoisceacha cosúil leis na Naitsithe. Nuair a bhí an cogadh thart, bhí cuid de na Gearmánaigh ag moladh Thomas Mann a cheapadh mar chéad Uachtarán ar Chomhphoblacht na Gearmáine, is é sin, ar an nGearmáin Thiar. Ní raibh sé féin rófháiltiúil roimh a leithéid, agus san am sin, tharraing sé fearg na nGearmánach anuas air nuair a d'fhoilsigh alt faoin teideal Cén fáth nach bhfillfidh mé ar an nGearmáin? San alt seo, thug sé le tuiscint go raibh sé ag cur an mhilleáin faoi Hitler ar mhuintir na Gearmáine go léir. Chuir an méid seo an-fhearg ar na Gearmánaigh, agus is iomaí léirmheastóir nach raibh sásta, ina dhiaidh sin, aon mhaitheas a aithint ar an úrscéal úd Doktor Faustus. Thóg sé roinnt mhaith blianta sular mhaolaigh ar an bhfearg seo sa Ghearmáin. I ndiaidh bhás Franklin Delano Roosevelt, thosaigh saol na Stát Aontaithe ag forbairt i dtreo nár thaitin le Mann. Cuireadh Cumannachas agus Stailíneachas ina leith, agus b'éigean dó dul i bhfianaise an Choiste um Ghníomhaíocht Fhrith-Mheiriceánach le cur síos a thabhairt ar an "bhfrith-Mheiriceánachas" a bhí idir lámhaibh aige. Sa bhliain 1952, d'fhill sé ar an Eilvéis, agus shocraigh sé síos, ar dtús, in Erlenbach in aice le Zürich, agus ina dhiaidh sin i gKilchberg cois Loch Zürich. Théadh sé ar cuairt go dtí an Ghearmáin ó am go ham, agus ba chuma leis cé acu stát a bhí i gceist, cé gur chuir sé isteach ar mhuintir an Iarthair, nuair a chuaigh sé, abair, go Weimar in Oirthear na Gearmáine. Is é an freagra a thug sé ná "nach n-aithníonn an Ghearmáin s'agam aon limistéar" - nó Zone - "thar an limistéar eile". Is é sin, an chuid den Ghearmáin a bhí gafa ag na díormaí Sóivéadacha - áit ar tháinig an Phoblacht Ghearmánach Dhaonlathach ar an bhfód sa bhliain 1949 - bhí sí chomh Gearmánach, chomh cóngarach do chultúr na Gearmáine, agus an chuid iartharach, dar le Thomas Mann. 15 Bealtaine 1955 Weimar, Die Friedrich-Schiller-Universität, Jena, "doctor honoris causa". Sa bhliain 1955, fuair Mann bás in ospidéal i Zürich. B'í an artairiscléaróis ba trúig bháis dó, go bunúsach. Ar dtús, fuair sé trombóis ina chos chlé, nuair a bhí sé ag filleadh abhaile ó Noordwijk san Ollainn, áit a raibh sé ag ligean scíthe agus ag snámh i Mí Iúil. Ar dtús, fuair sé biseach beag, ach ansin, thosaigh na cúrsaí ag dul chun donais. Sa deireadh, shíothlaigh sé ar an 12 Lúnasa 1955. Bhí sé ceithre fichid bliain d'aois. hAdhlacadh é i gKilchberg. Tugadh an leathanach seo cothrom le dáta an 27 Bealtaine 2018 ag 19:20.